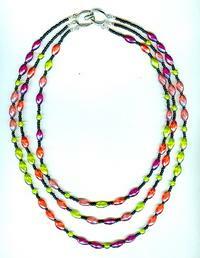 Fuchsia, peridot, apricot and tangerine twisted oval pearlised beads glow serenely against matte black seed beads in this stunning longer necklace. Three long strands of drape gracefully, with the shortest measuring about 20 inches. Dress it up to wear to a party, dress it down to go to the office; this necklace is every bit as versatile as the lady who wears it. It?s another fabulous design from SPARKLE PLENTY. All designs, text and photos copyright Sparkle Plenty Fine Beaded Jewellery 2002-2009 and may not be reproduced in whole or in part without prior, express written permission. All rights reserved. The rose crystal round and 'nose cone' beads are probably machine-cut, and are fairly recent in manufacture.